Students pass in front of Harvard's Widener Library in Cambridge, Massachusetts. Editor's note: Clayton Christensen, Robert and Jane Cizik professor of business administration, Harvard Business School, and Henry Eyring, advancement vice president, BYU-Idaho, are co-authors of "The Innovative University: Changing the DNA of Higher Education from the Inside Out," (Jossey-Bass, August 2011). (CNN) -- Is college an invaluable waste of time? You bet. But it's about to get even more valuable. It's great to see capable people debating the value of higher education. Earlier this month, Dale Stephens, a 19-year-old entrepreneur who has won a $100,000 Thiel Fellowship, wrote that "College is a waste of time." One can argue that Dale is too young -- and too extraordinarily intelligent -- to be a good judge of the value of college to the average person. But if students like Dale, the kind that the best schools want to attract, are dissatisfied, that can't be good. Anyhow, Dale's description of college as a place of conformity, competition and regurgitation strikes an uneasy chord with some of us older, more-ordinary folk. Two more smart people responded to Dale's argument. One of them, Brian Forde, is a successful entrepreneur who went back to school for an MBA degree because he found gaps in the knowledge he needed to lead his company. Brian described his higher education as "invaluable." Joseph Aoun, whose Northeastern University runs one of the best cooperative education programs anywhere, argued that "College is your best bet." He shared sobering data on the price of not having a college degree in difficult economic times such as these. It's important to be debating these things, because Dale, Brian, and Joseph are all correct. Going to college today is more important than ever. In this world of unprecedented change, now isn't the time to be staying away from the institutions whose primary mission is to discover and share knowledge. But these institutions have put themselves at risk by allowing the education they offer to become expensive, hard to access and unengaging relative to what is possible. They didn't mean to do this. In fact, our colleges and universities are all about getting bigger and better, and their success has made us much better off. 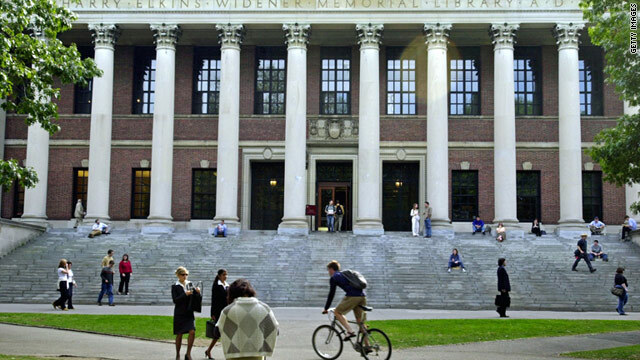 The problem is that too many of them, including former community colleges and technical institutes, now act more like Harvard, the world's most widely admired university. Imitating Harvard is a problem for two reasons. One is the cost: If you don't have a multibillion-dollar endowment and government research funding, the only alternative is to raise tuition. The other problem is that the basic elements of the Harvard model of education are roughly 100 years old. Thus, its imitators have, with the best of intentions, become expensive, exclusive and distanced from the nonacademic world. As Dale senses, things are set to change, even at the most prestigious colleges and universities. New technology is disrupting the status quo: Online learning is inexpensive to provide and increasing in quality. But we're not likely to see traditional campuses folding the way that newspapers and video rental stores have. It's one thing to give up the smell and feel of newsprint, or browsing a video aisle, and something else for a young person to give up the invaluable experience of going to college. Still, traditional institutions must change. The summer break, for example, is a tradition that few schools can afford. (Imagine what health care would cost if hospitals operated only eight months per year.) Most intercollegiate athletic programs need to be resized, as Northeastern has done recently, and as Harvard and its Ivy League peers did more than 50 years ago. Many schools that have started graduate programs and decreased their faculty teaching loads in an attempt to enhance their scholarly standing need to refocus on teaching undergraduates. It won't be easy for universities, whose name implies doing everything, to focus on what they can do uniquely well. Harder still for many will be the adoption of online learning technology. Even the most talented faculty members may see it as a tool for not only cheapening the student learning experience but also putting them out of business. It's true that online learning represents an industrial revolution in higher education. It offers the means to grant certifications and degrees to the masses of qualified would-be students who can't afford to stop working and relocate to a traditional campus. But this industrial revolution in higher education will also bring a learning renaissance on the campus. Aided by instructional designers and computer specialists, good teachers can create learning experiences online that aren't possible in the classroom but which make the face-to-face learning better when the students get to class. Rather than replacing the beloved college professor, the new learning technology will enhance that professor's impact and reach. "Going to college" will take on new meaning. More students will do it, though not all of them will be on a traditional campus all the time. Courses will be hybrids of the best online and face-to-face learning experiences. Schools will focus on their unique strengths and thus grow stronger. College will become a better bet than ever. It's hard to imagine such possibilities, but the debate is beginning to make them clearer.